The thirteenth, par 3 requires a short to mid iron off the tee. Water on the right and two bunkers pinching the green, an accurate tee shot may save you some frustration. The green is divided by a strong ridge and sits up in the back left corner to create some very challenging pin positions. 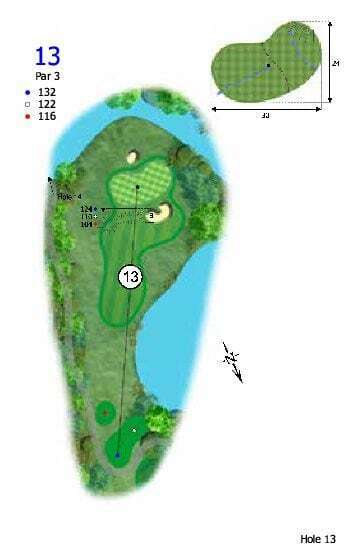 A good par 3 that will test your ability. Attack the pin on this par 3 while being cautious not to hit into one of the bunkers, as an easy par could turn into an easy bogey. Please note: Click on the course diagram to download and print out. GET YOUR PRE PAID ROUNDS HERE AND SAVE!